Get the latest news and updates on professional football clubs, including Juventus FC, based in Turin, Piedmont, Italy. Juventus was founded in 1897, and is now one of the most famous teams in the world. Read the news and information about the establishment and development of Juventus. The club has won a large number of trophies – including the UEFA Champion League. Follow RT for the news and updates on the games and activities of Juventus. In summer 2018, one of the world’s most famous footballers Cristiano Ronaldo was transferred to Juventus from Real Madrid. Don’t miss news on the career of Cristiano Ronaldo, his transfer and the careers of other Juventus players. Juventus secured an eighth straight Serie A title as they beat Fiorentina on Saturday. The title win means Cristiano Ronaldo becomes the first player to win the top-tier league in Italy, Spain and England. Ajax produced another seismic shock as they defeated Juventus 2-1 on the night in Turin to win their UEFA Champions League quarter-final tie 3-2 on aggregate. 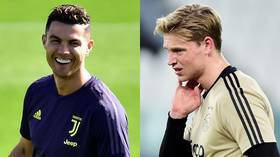 Tuesday's UEFA Champions League quarter-final second leg tie in Turin sees both Juventus and Ajax looking to welcome back influential stars with the tie perfectly poised at 1-1 after the first leg in Amsterdam. A Juventus team minus a host of stars including Cristiano Ronaldo were made to wait to wrap up an eighth consecutive Serie A title as they slipped to defeat at SPAL. A typically assured Cristiano Ronaldo header wasn't enough to see off a talented Ajax side, as they showed the Italian champions that they won't be pushovers in The Old Lady's pursuit of their first Champions League in 26 years.